Lenovo’s IdeaCentre Q150 works better as a media player than a full-on HTPC, but its reasonable price and put-it-anywhere form factor make it a good candidate for situations where a full-size, full-power PC is impractical or unnecessary. Lenovo’s ultra-compact IdeaCentre Q150 represents what may very well be one of the smallest and most-affordable PCs for practical use on the market. Obviously, one would expect some trade-offs in terms of performance, but Lenovo has packed some surprising media-playback horsepower into the Q150’s polished, diminutive form factor. Our review unit came specced with an Intel Atom D510 running at 1.6GHz and two gigs of DDR3 RAM to power the Windows Home Premium 32-bit OS. A recovery partition occupies 30 gigs of the 500GB hard drive. 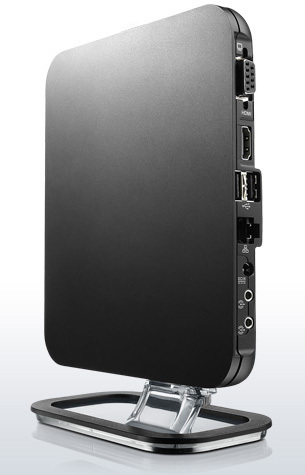 It has built-in 802.11b/g/n wireless LAN as well as a gigabit Ethernet port. Nvidia’s Ion GPU brings 512MB of video processing. The unit has no optical drive or card reader, but comes with a small USB keyboard and mouse. 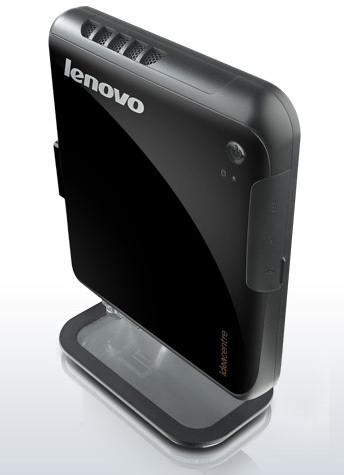 Lenovo also supplied us with one of the company’s N5901 wireless controllers, though it does not come standard. With a street price of $350, the Q150 is even cheaper than some barebones systems. Though the Q150 has an attractive design and satisfying heft, the standout attribute is the machine’s compact size. Lenovo had to forego an optical drive and card reader to trim the inches, but thankfully there are enough ports to connect just about anything: two USB 2.0 ports and an S/PDIF optical output underneath a small flap on the front, and two more USB 2.0 ports, Ethernet, VGA-out, HDMI-out, and headphone & mic jack on the rear. Inside the box, Lenovo includes a stand for using the machine in a vertical orientation, as well as a VESA bracket for mounting it on the rear of a monitor. The included USB mouse and keyboard work fine, but the wires are so short that you’ll almost have your nose up against your TV screen if you set up the Q150 near your A/V components. The N5901 hand-held control worked okay for point-and-clicking, but typing on it proved annoying, given the tiny keys and lack of backlighting. We would much prefer that the Q150 come with a Bluetooth keyboard and mouse (or at least a backlit remote for use in a dim home theater setting). Except for McAfee Security Center, we found a desktop thankfully free of bloatware upon the first boot. You’ll want to either activate or uninstall the McAfee suite right away, as you’ll get a nag screen every five minutes or so if you don’t. 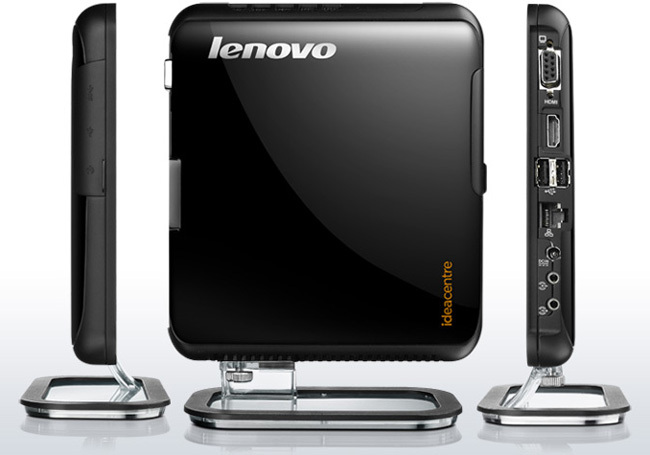 Lenovo’s decision to opt for the 32-bit flavor of Windows 7 Home puzzled us, since all the hardware supports 64-bit. As a media-playback device, the Q150 performs admirably for its small size and low-voltage components. It had no problems playing 1080p video files and high-fidelity audio files, or streaming Divx files over a Wi-Fi network. However, apart from very basic operations like word processing and light Internet browsing, any task requiring even moderate processing power revealed the Q150’s shortcomings. Despite the Atom processor’s dual cores, the Q150 struggled to keep up when multitasking or crunching lots of numbers. ITunes alone took over four minutes just to install. Similarly, encoding from one media format to another often moved at a glacial pace, something that will no doubt frustrate those using the Q150 as an HTPC. In many cases, it would be faster to do the transcoding on one’s main desktop or laptop PC and then transfer the media files to the Q150 via a thumbdrive than to let the Q150 do all the work. Newegg.com sells a version of the Q150 loaded with Windows XP Home for $219, and we can’t help but wonder how a lighter OS load might improve performance. As a media player, the Lenovo IdeaCentre Q150 performs quite well. The unit’s small stature and multiple mounting options make it a solid choice for installation in a location short on space, and its good looks hold up nicely against home theater components. On the other hand, its anemic processor delivers some bottom-of-the-barrel performance in multitasking and encoding roles, two areas that power users will sorely miss. However, if you can live with the Q150’s limitations, the $350 price tag is tough to beat.